How did we find ourselves spending the whole day in camp and having our sundowners on the deck rather than heading out on the usual evening game drive? It’s normal to be greeted back at camp after your morning game drive with a cool flannel and a “Welcome back”. On this day, there was an additional message – there are lions by the deck! Some of the local Kamesot pride had decided to “hang out” for the day by the side of the main deck leading to a day of tiptoeing around the camp so they wouldn’t be disturbed. This meant we got to hang out too in the lounge area of the camp, reading books, chatting quietly with drinks, and of course, watching the lions. 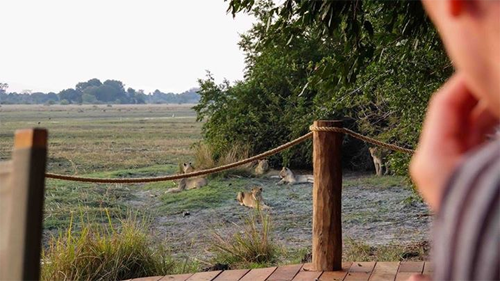 After sleeping the afternoon away, around 5pm the lions began to stir so we moved quietly to the deck with our Gin and Tonics and looked on in amazement as they stretched, yawned, watched the lagoon with mild interest and then ultimately moved off for an evening’s hunting. My first sight of the view from the camp was literally breath-taking – it’s situated on a permanent lagoon in an area of the Kafue National Park that is remote, unspoiled and pretty much unexplored. This makes for a very different and rather special safari experience where the wildlife viewing is so good from camp itself. For the last 3 years, 16,000 hectares have been protected from fire resulting in huge increases in the birth and survival rates of young. When establishing the camp, they took their time. Once spotted, if they moved off, the team never followed predators such as lion and leopard. 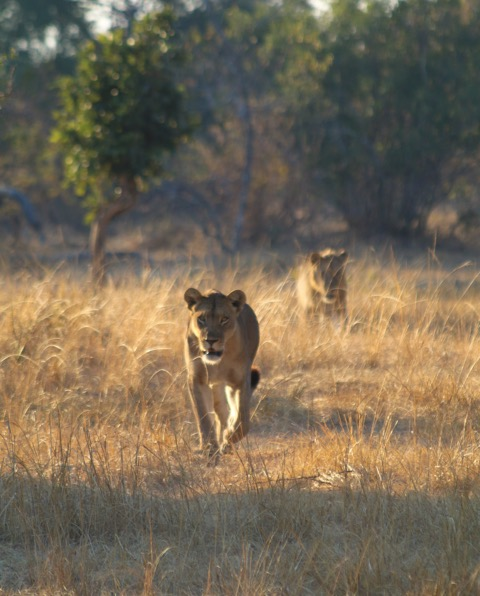 I remember a trip back in October 2014 when we first spotted 2 female lions and cubs who are now known as the Kamesot pride. We knew then that we could be the first humans these lions had ever seen; we kept our distance, never tried to get close and quietly watched the cubs playing happily, unaware of us. I had such a strong sense then, even as a guest, of being part of the development and protection of the area and now nearly 2 years later, that feeling remains true. The camp has ultimately become part of the lions’ scenery which accounts for the quality, frequency and proximity of sightings that are both incredible and very unusual. The high numbers of antelope also means an abundance of predators. During my visit in July, I counted 200 Puku immediately in front of us during one lunchtime, but in the late season the number of antelopes will reach the 1000’s. The area is so rich that many bushbuck can be seen; animals that are normally territorial and aggressive. On an evening’s game drive, close to camp, we saw 4 bushbuck males sharing a few metres of space. 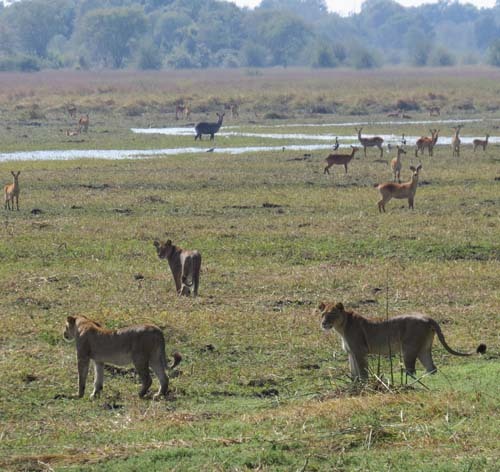 Many days of the trip saw lions out on the lagoon and close to the camp. The Kamesot Pride number 12, including 4 cubs, while the Musekese Pride number 5 plus unknown cubs at time of writing. This means with the number of lions over 20, the chances of seeing them on an almost daily basis are high. On the most memorable morning game drive of many years of safari, I saw 13 lions, including 6 adolescents that I had seen as cubs in 2014 who have all survived. During the lion fest that morning, Phil and I watched 2 of “our cubs” hunting (unsuccessfully) a Puku right by the car and then looked at each other in amazement as we could just see moving in the grass, 4 new cubs being moved by their mother. We were so overwhelmed we took an early coffee break at the confluence, a beautiful spot a short drive from camp, and drank coffee, all the while watching the head and ears of Bones some distance away hiding in the grass, while he too kept an eye on us. It’s not all about lions though. During my latest visit to Musekese Camp in July 2016, I totted up a total of 31 species, many of which can be watched on a daily basis from either the main deck of the camp or from the privacy of your own deck outside your chalet. Antelopes photographed from my chalet included Puku, Waterbuck and Bushbuck and those spotted out on the game drives ranged from the large Kudu and Sable to the small Grysbok and Oribi. 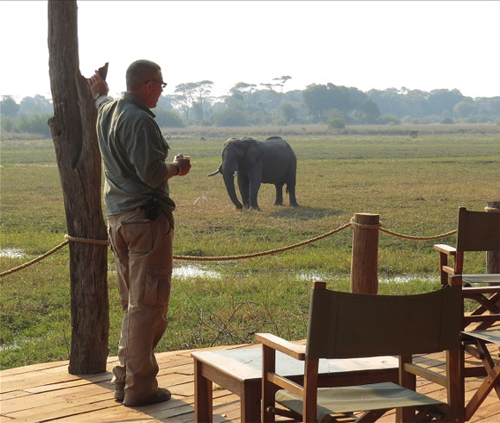 Other great sightings from the deck include daily visits by bull elephants and the breeding herds that graze on the lagoon or cross to the Kafue River. An afternoon game drive was postponed for an hour and a half to stay in camp watching a bull elephant that wandered through and spent his time eating from the Marula tree and drinking from the water right in front of the deck. If you’re a birder, then even in camp, the species list is almost at 200 and I had interesting sightings such as the Twinspot sitting on a log by the car. 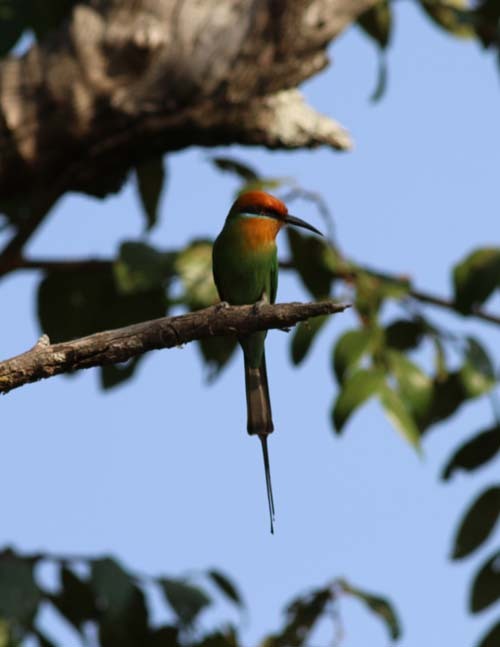 One afternoon I photographed Bohms Bee-eaters and a Black-Backed Barbet in the tree by my chalet. From the deck, I whiled away the hours watching a great variety of water birds including beautiful Wattled and Crown Cranes. The night time is full of action too. I found the noise of the hippos to be hypnotic during the night, the sound of their munching grass similar to waves lulled me to sleep, but I was frequently woken up by the calls of lions and hyena with the occasional leopard. Most mornings we would see the tracks of a leopard that had walked through the camp and our guides would warn us that the noise of heavy breathing outside our chalets was likely to come from a porcupine that moved around the camp at night! I found Musekese Camp to be a place where I could exhale, relax and take my time. A magnet for wildlife, the animals are at peace with each other and the people. Staying here means you are more than an observer – more than any other safari camp I’ve visited over the years, I felt 100% part of what’s going on, part of the scenery and the action. Lesley Pritt travelled to Africa with Busanga Safaris.